The bull market’s future may come down to just one economic chart. According to economic forecaster Lakshman Achuthan, the trend between income and spending growth is signaling trouble is already here. 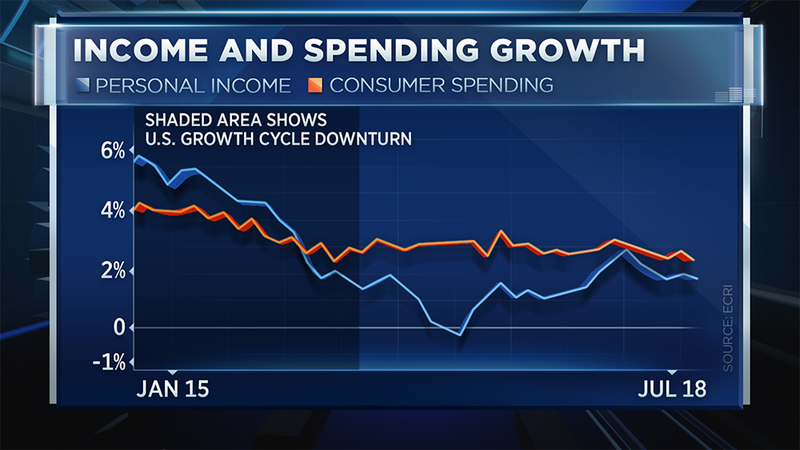 The co-founder of the Economic Cycle Research Institute is hyper-focused on it — calling it the single most important chart out there right now because it suggests inflation is already corroding spending power. “Here’s 70 percent of the U.S. economy which is slowing,” he added. It’s not the first time Achuthan has addressed the chart on “Trading Nation.” In late May, the former self-proclaimed super bull said the economy was “cruising for a bruising.” His latest data show the trend is deteriorating. Achuthan’s latest thoughts came the same day the government posted June retail sales numbers that suggested robust economic growth. But the data aren’t swaying him in a more positive direction. “Retail sales, the headline numbers that are making the rounds today [Monday], those are all nominal. So when you adjust for inflation, the shine comes off,” Achuthan said, adding real consumer spending growth is broader than retail sales.